Would you like to set some weight loss goals? Let me stop you right there. Studies show that jumping into a fitness program with weight loss goals sets you up for failure and lack of satisfaction in your fitness program. Weight loss will happen for you IF you need to lose weight, you have a consistent fitness routine AND a healthy nutrition plan. When these things become second nature you shouldn't have to set weight loss goals. Fitness should be about enjoyment. Enjoying moving your body, becoming stronger, lengthening your lifespan and enjoying a more fulfilled life. Being consistently active will help improve your mood and prevent/reverse obesity related illnesses. What's more important? Fitting into your skinny jeans or improving your longevity? 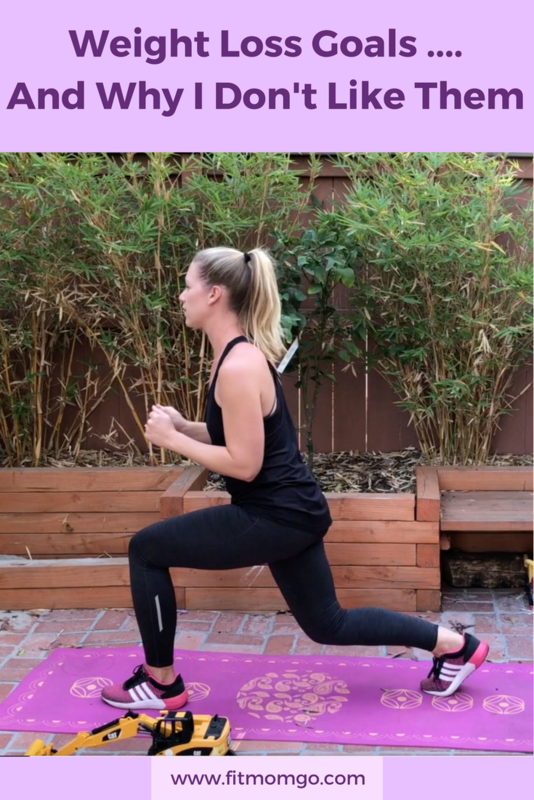 This workout includes a HIIT circuit. The high intensity interval training lasts about 10 minutes and will move you from cardio to upper body and lower body on repeat. This is one of the fastest known ways of increasing your fitness levels. Erin Kendall is an American Council on Exercise Certified Personal Trainer with 2 little toddlers at home. While juggling a household, two kids, three pets and maintaining a little sense of self she hopes to bring a ray of hope and sunshine to other busy moms through Fit Mom Go! Fitness for Moms is more than a few minutes of "me time." It's a lifestyle that we pass onto our children and radiate in everything we do. Erin has been a personal trainer since 2009 and works with clients in person, online and maintains a community of other Fit Moms. She has a long history of working with women and moms to help find a healthy fit lifestyle balance with real life! Disclosure: You may see affiliate links on this page and If you click through to make a purchase I may receive a commission.